Not to be confused with Rome III. Third Rome is the hypothetical successor of ancient Rome (the "first Rome"). Second Rome usually refers to Constantinople, the capital of the Byzantine Empire, unofficially called "New Rome", or one of the claimed successors to the Western Roman Empire such as the Papal States and the Holy Roman Empire. Known as a theological and a political concept "Moscow is the Third Rome", it was formulated in the 15th–16th centuries in the Grand Duchy of Moscow. In the concept there could be traced three interrelated and interpenetrating fields of ideas: a) theology that is linked with justification of necessity and inevitability in unity of Eastern Orthodox Church; b) social politics that are derived out of the feeling of unity in East Slavic territories being historically tied through Christian Orthodox faith and Slavic culture; c) state doctrine, according to which the Moscow Prince should act as a supreme sovereign (Sovereign and legislator) of Christian Orthodox nations and become a defender of the Christian Orthodox Church. Herewith the Church should facilitate the Sovereign in execution of his function supposedly determined by God, the autocratic administration. After the fall of Tǎrnovo to the Ottoman Turks in 1393, a number of Bulgarian clergymen sought shelter in the Russian lands and transferred the idea of the Third Rome there, which eventually resurfaced in Tver, during the reign of Boris of Tver, when the monk Foma (Thomas) of Tver had written The Eulogy of the Pious Grand Prince Boris Alexandrovich in 1453. Within decades after the capture of Constantinople by Mehmed II of the Ottoman Empire on 29 May 1453, some Eastern Orthodox people were nominating Moscow as the "Third Rome", or the "New Rome". Stirrings of this sentiment began during the reign of Ivan III of Russia who had married Sophia Paleologue. Sophia was a niece of Constantine XI, the last Byzantine emperor. By the rules and laws of inheritance followed by most European monarchies of the time, Ivan could claim that he and his offspring were heirs of the fallen Empire, but the Roman traditions of the empire had never recognized automatic inheritance of the Imperial office. It was also Sophia's brother, Andreas Palaiologos, who held the rights of succession to the Byzantine throne. Andreas died in 1502, having sold his titles and royal and imperial rights to Ferdinand II of Aragon and Isabella I of Castile. A stronger claim was based on religious symbolism. The Orthodox faith was central to Byzantine notions of their identity and what distinguished them from "barbarians". Vladimir the Great had converted Kievan Rus' to Orthodoxy in 988, in return for which he became the first barbarian to ever get an Imperial princess as a wife. 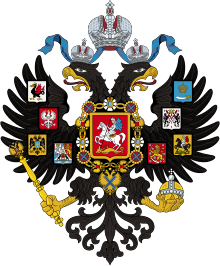 The idea of Muscovy as heir to Rome crystallized with a panegyric letter composed by the Russian monk Philotheus (Filofey) of Pskov in 1510 to their son Grand Duke Vasili III, which proclaimed, "Two Romes have fallen. The third stands. And there will be no fourth. No one shall replace your Christian Tsardom!" Contrary to the common misconception, Filofey explicitly identifies Third Rome with Muscovy (the country) rather than with Moscow (the city), although the term "Muscovy" was considered synonymous with the Russian lands at the time. Somewhat notably, Moscow is placed on seven hills, as were Rome and Constantinople. The whole idea could be traced as early as 1492 when Metropolitan of Moscow Zosimus expressed it in a foreword to his work of 1492 "Presentation of the Paschalion" (Russian: "Изложение Пасхалии"). Shortly before Joseph II inherited the States of the House of Austria, he traveled to Russia in 1780. In her conversations with him Catherine II made it clear that she would renew the Byzantine empire and to use her one-year-old grandson Konstantin as Emperor of Constantinople. The guest tried to suggest to the guest that he could be held harmless in the Papal States. The Sultanate of Rûm established in the parts of Anatolia which had been conquered from the Byzantine Empire by the Seljuk Empire. The name Rûm is the Arabic name of Rome and the Roman Empire, الرُّومُ ar-Rūm, a loan from Greek Ρωμιοί "Romans". After the fall of Constantinople in 1453 AD, Mehmed II declared himself Kayser-i Rum, literally "Caesar of Rome". The claim was recognized by the Orthodox Patriarch of Constantinople, but not by Roman Catholic Western Europe. Gennadios (Georgios Scholarios), a staunch enemy of the West, had been enthroned Patriarch of Constantinople with all the ceremonial attributes of Byzantium by Mehmed himself acting as Roman Emperor and in turn Gennadios recognized Mehmed as successor to the throne. Mehmed's claim rested with the concept that Constantinople was the seat of the Roman Empire, after the transfer of its capital to Constantinople in 330 AD and the fall of the Western Roman Empire. 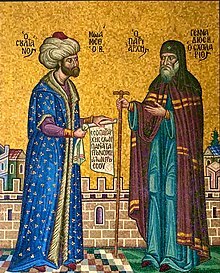 Mehmed also had a blood lineage to the Byzantine Imperial family; his predecessor, Sultan Orhan I had married a Byzantine princess, and Mehmed may have claimed descent from John Tzelepes Komnenos. During that period the Ottoman Empire also destroyed Otranto and its people, and Mehmed II was planning on taking Rome itself when the Italian campaign was cut short by his sudden death. The title fell into disuse after his death, but the imperial bodies created by Mehmed II lived on for centuries to come. The term appeared for the first time during the debates of Prime Minister Ioannis Kolettis with King Otto that preceded the promulgation of the 1844 constitution. This was a visionary nationalist aspiration that was to dominate foreign relations and, to a significant extent, determine domestic politics of the Greek state for much of the first century of independence. The expression was new in 1844 but the concept had roots in the Greek popular psyche. It long had hopes of liberation from Turkish rule and restoration of the Byzantine Empire. πάλι δικά μας θα 'ναι! (Once more, as years and time go by, once more they shall be ours). The Megali Idea implied the goal of reviving the Eastern Roman (Byzantine) Empire, by establishing a Greek state, which would be, as ancient geographer Strabo wrote, a Greek world encompassing mostly the former Byzantine lands from the Ionian Sea to the west, to Asia Minor and the Black Sea to the east and from Thrace, Macedonia and Epirus to the north, to Crete and Cyprus to the south. This new state would have Constantinople as its capital: it would be the "Greece of Two Continents and Five Seas" (Europe and Asia, the Ionian, Aegean, Marmara, Black and Libyan seas, respectively). In 913, Simeon I of Bulgaria was crowned Emperor (Tsar) by the Patriarch of Constantinople and imperial regent Nicholas Mystikos outside of the Byzantine capital. In its final simplified form, the title read "Emperor and Autocrat of all Bulgarians and Romans" (Car i samodǎržec na vsički bǎlgari i gǎrci in the modern vernacular). The Roman component in the Bulgarian imperial title indicated both rulership over Greek speakers and the derivation of the imperial tradition from the Romans, however this component was never recognised by the Byzantine court. Byzantine recognition of Simeon's imperial title was revoked by the succeeding Byzantine government. The decade 914–924 was spent in destructive warfare between Byzantium and Bulgaria over this and other matters of conflict. 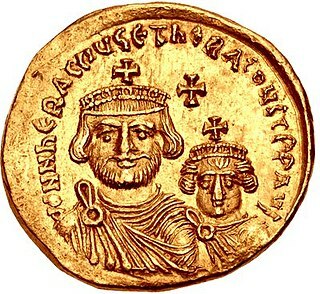 The Bulgarian monarch, who had further irritated his Byzantine counterpart by claiming the title "Emperor of the Romans" (basileus tōn Rōmaiōn), was eventually recognized, as "Emperor of the Bulgarians" (basileus tōn Boulgarōn) by the Byzantine Emperor Romanos I Lakapenos in 924. Byzantine recognition of the imperial dignity of the Bulgarian monarch and the patriarchal dignity of the Bulgarian patriarch was again confirmed at the conclusion of permanent peace and a Bulgarian–Byzantine dynastic marriage in 927. In the meantime, the Bulgarian imperial title may have been also confirmed by the pope. The Bulgarian imperial title "tsar" was adopted by all Bulgarian monarchs up to the fall of Bulgaria under Ottoman rule. 14th-century Bulgarian literary compositions clearly denote the Bulgarian capital (Tarnovo) as a successor of Rome and Constantinople, in effect, the "Third Rome". In 1345, the Serbian King Stefan Uroš IV Dušan proclaimed himself Emperor (Tsar) and was crowned as such at Skopje on Easter 1346 by the newly created Serbian Patriarch, and by the Patriarch of All Bulgaria and the autocephalous Archbishop of Ohrid. His imperial title was recognized by Bulgaria and various other neighbors and trading partners but not by the Byzantine Empire. In its final simplified form, the Serbian imperial title read "Emperor of Serbs and Greeks" (цар Срба и Грка in modern Serbian). It was only employed by Stefan Uroš IV Dušan and his son Stefan Uroš V in Serbia (until his death in 1371), after which it became extinct. A half-brother of Dušan, Simeon Uroš, and then his son Jovan Uroš, claimed the same title, until the latter's abdication in 1373, while ruling as dynasts in Thessaly. The "Greek" component in the Serbian imperial title indicates both rulership over Greeks and the derivation of the imperial tradition from the Romans. The claimant Eastern Roman Emperor Andreas Palaiologos ceded the Roman Imperial crown to Ferdinand II of Aragon and Isabella I of Castile in his last will dated April 7, 1502. Many cities and institutions in the Kingdom of Spain to this day use the double-headed Roman eagle. The city of Toledo, province of Toledo and the province of Zamora are just few of many examples. The Latin Empire (official Empire of Romania) was a Crusader state founded after the Fourth Crusade on lands captured and usurped the imperial thorne from the Byzantine Empire (Eastern Roman). The Latin Empire was intended to supplant the Byzantine Empire as the titular Roman Empire in the east, with a Western Roman Catholic emperor enthroned in place of the Eastern Orthodox Roman emperors. James of Baux willed his titular claims to Duke Louis I of Anjou, also claimant to the throne of Naples, but Louis and his descendants (including the Holy Roman Emperor from the House of Habsburg-Lorraine and the Austrian emperors through Francis I) never used the title. Both claimed to be the heir of the Holy Roman Empire. The Carolingian Empire has been claimed to have deliberately sought to revive the Roman Empire in the West. According to early German nationalism, the Carolingian Empire transformed into the Holy Roman Empire as a continuation of the Western Roman Empire. In 800, the title of Emperor of the Romans was granted to Charlemagne by Pope Leo III. The word "holy" (often retroactively applied to all emperors since Charlemagne) was added under the reign of emperor Frederick I Barbarossa in 1157. Later the German Empire in 1871 also claimed to be the Third Rome, also through lineage of the HRE. The title for emperors of the Holy Roman Empire, the Austrian Empire and the German Empire was Kaiser (derived from Latin Caesar), the German word for emperor. Claims by the German Empire of 1871 to 1918 of being a "Third Rome" have been criticized because the German Empire was led by a Protestant ruler and no concordat had been achieved with the Catholic Church (that was a major basis of the continuation of Roman culture in the West). Nazi Germany used the term Drittes Reich (meaning "Third Realm" or "Third Empire"), as successor of the first realm (HRE) and the second realm (the German Empire). In 1939, however, in a circular not intended for publication, further use of the term "Third Reich" was prohibited. After the Holy Roman Empire was dismantled in 1806, the Austrian Empire sought to lay claim as the heir of the Holy Roman Empire as Austria's Habsburgs attempted to unite Germany under their rule. The Cross potent, symbol of the Fatherland Front, was as medieval symbol - the oldest representation is on the (German) Imperial Sword (one of the four most important parts of the Imperial Regalia of the HRE). The consistent use of this propaganda symbol was new to Austria. 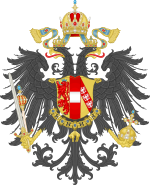 In contrast to the one-headed, graphically strictly designed eagle of the German Reich, the eagle of the estates state leaned against the two-headed Quaternionenadler of the Holy Roman Empire. Since Old Austria had led the double eagle for centuries, since the Habsburgs became Holy Roman Emperor, the return to it seemed nostalgic. The traditional care with elements of imperial Austria, the admission of aristocratic titles and the partial reversal of the Habsburg Law fit in with this. The Austrian Armed Forces received in 1934 (with the exception of the small air forces) instead of the previously worn comparatively modern uniforms in the style of the Reichswehr such in the manner of the Danube monarchy. In four campaigns, Napoleon transformed his "Carolingian" feudal and federal empire into one modelled on the Roman Empire. The memories of imperial Rome were for a third time, after Julius Caesar and Charlemagne, used to modify the historical evolution of France. Though the vague plan for an invasion of Great Britain was never executed, the Battle of Ulm and the Battle of Austerlitz overshadowed the defeat of Trafalgar, and the camp at Boulogne put at Napoleon's disposal the best military resources he had commanded, in the form of La Grande Armée. Desperate for money, Andreas Palaiologos sold the rights to the Byzantine crown which he possessed since the death of his father. Charles VIII of France purchased the rights of succession from Andreas during 1494 and died on April 7, 1498. The following Kings of France continued the claim and used the Imperial titles and honors: Louis XII, Francis I, Henry II and Francis II. Not until Charles IX in 1566 did the imperial claim come to an eventual end through the rules of extinctive prescription as a direct result of desuetude or lack of use. Charles IX wrote that the imperial Byzantine title "is not more eminent than that of king, which sounds better and sweeter." In Italy, the concept of a "Third Rome" is related to the capital of the Kingdom of Italy, created in 1861, and the current Italian Republic, created in 1946. Flag of the Roman Republic of 1849 has a laurel wreath. This was a symbol of martial victory, crowning a successful commander during his triumph. Giuseppe Mazzini, Italian nationalist and patriot, promoted the notion of the "Third Rome" during the Risorgimento. He said, "After the Rome of the emperors, after the Rome of the Popes, there will come the Rome of the people", addressing Italian unification and the establishment of Rome as the capital. After the unification of Italy into the Kingdom of Italy, the state was referred to as the Third Rome by Italian figures. After the unification, Mazzini spoke of the need of Italy as a Third Rome to have imperial aspirations. 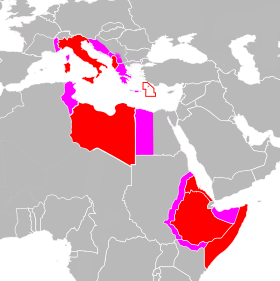 Mazzini said that Italy should "invade and colonize Tunisian lands" as it was the "key to the Central Mediterranean", and he viewed Italy as having the right to dominate the Mediterranean Sea as ancient Rome had done. 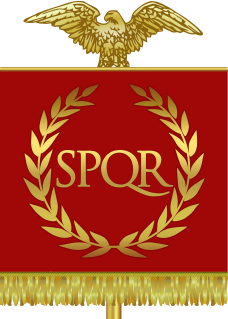 An aquila clutching a fasces was a common symbol used in Fascist Italy. In his speeches, Italian dictator Benito Mussolini referred to his Fascist Italy as a "Third Rome" or as a New Roman Empire. Terza Roma (Third Rome; the Fascist Rome after the Imperial and the Papal ones) was also a name for Mussolini's plan to expand Rome towards Ostia and the sea. The EUR neighbourhood was the first step in that direction. The concept of a "Third Rome" figures greatly in the second memoir of Whittaker Chambers. Although published posthumously as Cold Friday (1964), Chambers had planned it from inception as "The Third Rome". 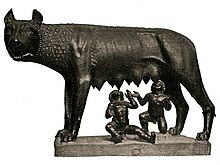 A long chapter called "The Third Rome" appears in the memoir. In the 1997 film, The Saint, the villain, Russian oil magnate Ivan Tretiak, publishes a book titled The Third Rome. Third Rome is also a DLC for the historical grand strategy game Europa Universalis IV. It adds features for Russian nations and the Orthodox religion. ^ "Why do Russians call Moscow the Third Rome?". 30 March 2017. ^ a b c d Mashkov, A.D. Moscow is the Third Rome (МОСКВА – ТРЕТІЙ РИМ). Ukrainian Soviet Encyclopedia. ^ Parry, Ken; Melling, David, eds. (1999). The Blackwell Dictionary of Eastern Christianity. Malden, MA: Blackwell Publishing. p. 490. ISBN 978-0-631-23203-2. ^ Derek Beales: Joseph II, Band 1, Cambridge 1987, p. 431–438. ^ Dimitri Kitsikis, Türk-Yunan İmparatorluğu. Arabölge gerçeği ışığında Osmanlı Tarihine bakış – İstanbul, İletişim Yayınları, 1996. ^ Norwich, John Julius (1995). Byzantium:The Decline and Fall. New York: Alfred A. Knopf. pp. 81–82. ISBN 978-0-679-41650-0. ^ Bunson, Matthew. "How the 800 Martyrs of Otranto Saved Rome". Catholic Answers. Archived from the original on 17 December 2013. Retrieved 30 May 2014. ^ a b c Craig M. White. The Great German Nation: Origins and Destiny. AuthorHouse, 2007. p. 139. ^ Warwick Ball. Rome in the East: The Transformation of an Empire. London, England, UK: Routledge, 2000. p. 449. ^ a b Craig M. White. The Great German Nation: Origins and Destiny. AuthorHouse, 2007. p. 169. ^ Reinhard Bollmus: Das Amt Rosenberg und seine Gegner. Studien zum Machtkampf im nationalsozialistischen Herrschaftssystem. Stuttgart 1970, S. 236. ^ a b Silvana Patriarca, Lucy Riall. The Risorgimento Revisited: Nationalism and Culture in Nineteenth-Century Italy. p. 248. ^ Chambers, Whittaker (1964). Cold Friday. New York: Random House. ^ O'Brien, Conor Cruise (19 November 1964). "The Perjured Saint". The New York Review of Books. ^ Chambers, David (9 July 2011). "Whittaker Chambers (1901–1961): Ghosts and Phantoms". WhittakerChambers.org. Dmytryshyn, Basil (transl). 1991. Medieval Russia: A Source Book, 850–1700. 259–261. Harcourt Brace Jovanovich. Fort Worth, Texas. Martin, Janet. 1995. Medieval Russia: 980–1584. 293. Cambridge University Press. Cambridge, UK. Stremooukhoff, Dimitri (January 1953). "Moscow The Third Rome: Sources of the Doctrine". Speculum. 84–101. The Fall of Constantinople was the capture of the capital of the Byzantine Empire by an invading Ottoman army on 29 May 1453. The attackers were commanded by the 21-year-old Sultan Mehmed II, who defeated an army commanded by Emperor Constantine XI Palaiologos and took control of the imperial capital, ending a 53-day siege that began on 6 April 1453. After conquering the city, Sultan Mehmed transferred the capital of the Ottoman State from Edirne to Constantinople and established his court there. Thomas Palaiologos or Palaeologus was Despot in Morea from 1428 until the Ottoman conquest in 1460. After the desertion of his older brother to the Turks in 1460, Thomas Palaiologos pretended to be the legitimate claimant to the Byzantine throne, a claim he maintained during his exile in Italy. 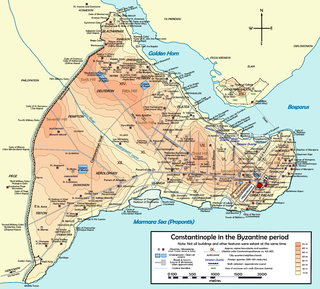 The Byzantine–Ottoman wars were a series of decisive conflicts between the Ottoman Turks and Byzantines that led to the final destruction of the Byzantine Empire and the rise of the Ottoman Empire.